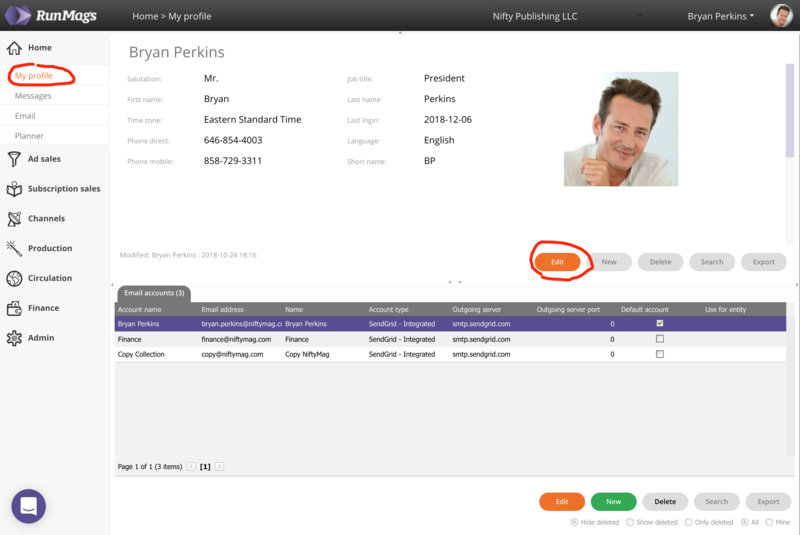 Adding your email account and contact details that will populate documents and automated email templates. In RunMags each user can administrate their contact information, upload a pic and set up one or several email accounts to use when sending emails to clients. In the navigation menu on the left side, click Home >>> My profile, then click the upper Edit button. 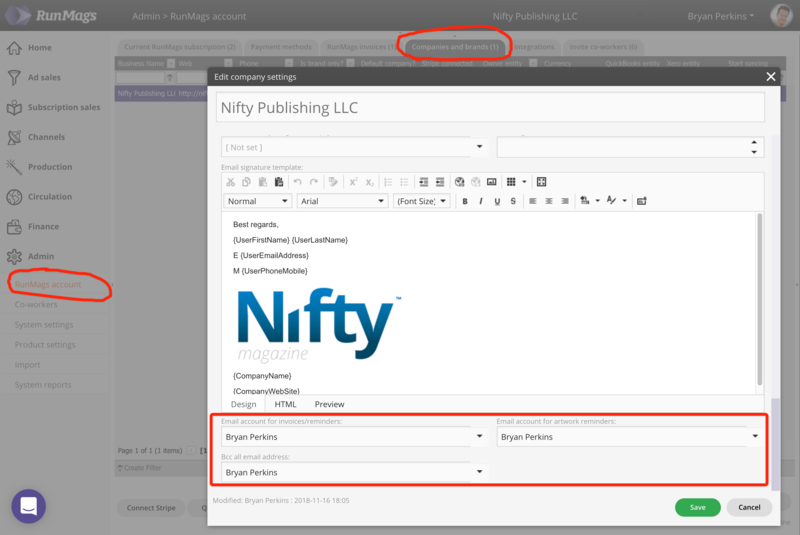 In the form you can add/change information that will populate contracts, invoices and email templates. You can also set RunMags up with access to your email so that you can email contacts from RunMags, rather than having to go to your email system. The benefit of emailing from RunMags is that each email will be tied to a contract in RunMags as well as an organization in case the contact belong to an organization. This will make it easy to share information within the team on what has been agreed to with customers. 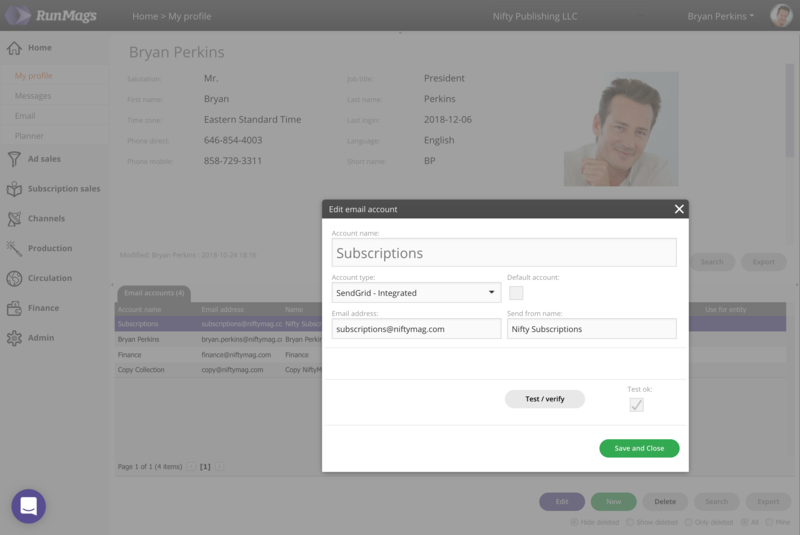 To set up an email integration, click the lower New button at the bottom right on the screen. Or if there is already an email account listed, you can click Edit to change the settings for it. To begin with, you have to decide what kind of email account you want to set up. In the drop-down menu called Account type you can select between various options. With the RunMags service you get up to 10,000 email free-of-charge through our SendGrid integration. SendGrid is a premium email service provider that also will allow you to send mass emails in RunMags. In your RunMags account, you can also sign up for dedicated IP addresses and large volumes of email on a monthly basis. If you prefer, you can also set up G Suite, Office 365 and other smtp email service provides as described below. Typically we have found that the SendGrid integration provides a great solution with a minimum of hassle associated with passwords being updated or Google and Microsoft making changes to their service. 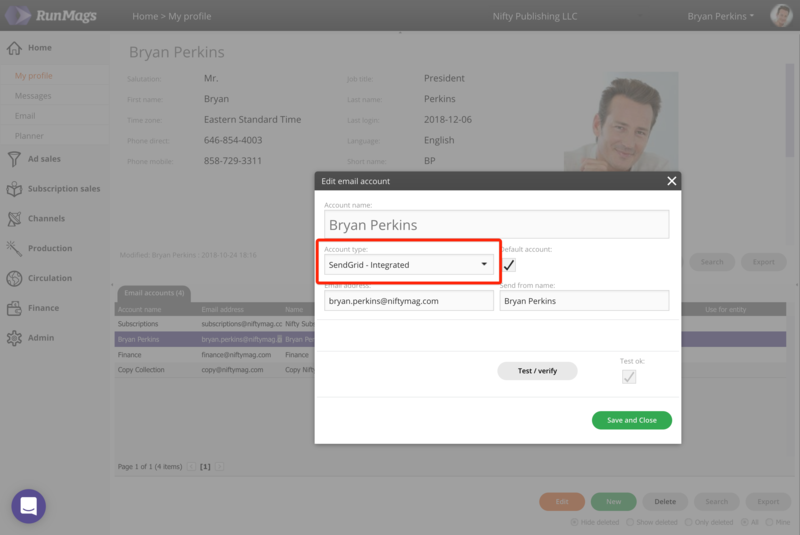 To set up an integrated SendGrid account, select SendGrid - Integrated in Account type. Enter the email address you want to use the the name that your recipients should see in the inbox. Click the Test / Verify button to test the integration. Tick the Default account check box to indicate which account you'll normally be sending email from. If you are operating on Google G Suite, select Gmail - Oauth2 in Account type. While RunMags can be set up to work with any SMTP email provider, RunMags is built with a deep integration with the Google G Suite Ecosystem. RunMags is a real cloud based system and an integration with Google G Suite will make the user experience more pleasant. Populate your password and click the button to Authenticate account in the lower left corner, This will open up Google's authentication tool. Click Allow. As Google's authentication tool closes, click the Test / Verify button to test the integration. If it's successful, you will receive an email from us in your normal email inbox and the checkbox for the test will be checked. If you have more than one Google Account, you can sign in to multiple accounts at once. That way, you can switch between accounts without signing out and back in again. For example, you can have one Chrome browser session on for your business email and a separate one open for your personal Gmail at the same time. From a productivity and security standpoint as well as keeping work and play separate, this is a great tool. More on that on Google's website. In case you work in this way, please make sure that you're working in the correct browser session. If you're using your personal session and you try to authenticate your business email in RunMags, you're likely going to see a conflict and the email won't work. Use Standard - SMTP for all providers except Google G Suite and SendGrid. Fill in your email address, password, email sender name, as well as the SMTP server and port details. Check off the box for "Outgoing secure"
You can set up several email accounts in case you want to be able to send email from a generic subscriptions@domain.com account, however one account always has to be the default account. Follow the steps above to set up each account you want to add. Once you have done this you can go to Admin >>> RunMags account and tghen the Companies and brands tab to select which account you want to use to send invoices and artwork reminders from.